Many people consider gear wheels to be an integral part of the Meccano system, but in fact they were surprisingly thin on the ground. The first gear wheel was introduced in 1902, but a choice of gear ratios wasn't available until 1915, with further gears in 1924 and 1931. Throughout the period of UK production, most gears were limited to the 10-outfit, with only one in outfits less than number 9. For this reason, the separate "Gears Outfit" introduced in 1949 was a popular addition to the system. Gear wheels in the Meccano system are cut approximately to 38dp (diametrical pitch). That is, they have 38 teeth for each inch of their pitch diameter. Pitch diameter is the effective size of a gear wheel taken where the teeth are designed to mesh (the teeth themselves extend inside and outside this theoretical size). 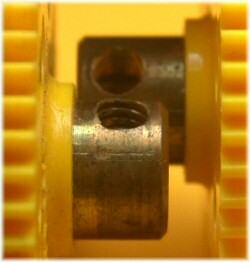 Obviously, Meccano gears are intended to be mounted at half-inch spacing in the standard Meccano holes. This half-inch spacing gives us our 19-tooth multiple (half of 38dp). The 19-tooth pinion mates with itself at ½'' spacing, 19-tooth pinion and 57-tooth gears mate at 1'' centres, the 19-tooth and 95-tooth at 1½'' centres, the 19-tooth and 133-tooth at 2'' centres. Some Meccano gears aren't quite right for this system, though. The 15, 25, 50, and 60-tooth gears are actually made at 37½dp, meaning that they don't quite match up with the other gears in the system properly. The 25 and 50-tooth gears mate at 1'' centres, but there should be 76 teeth (not 75) if they were made to the same specification as the other gears above. In practice, this isn't too much of an issue because of the tolerances involved, and because matching the two different 'families' of gears requires non-standard hole spacing anyway. Further reading on the design of Meccano gears can be found here, and an extremely comprehensive description by Alan Wenbourne is here. 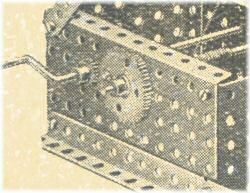 There are a huge number of variations in the early gears. Holes, finishes, and thicknesses all changed regularly and it's almost impossible to date most of them. The most significant one, however, is the shape of the teeth. Prior to about 1912, the teeth have a strange elongated form. From 1912 onwards, the teeth have a more 'correct' involute shape. You can see the difference from the photo to the right, showing early (top) and later (bottom) forms. Gears don't mesh well if these two types are mixed. Ed Barclay has pointed out an interesting change to the yellow plastic gears of the late 1970s. A number of these have longer bosses (see top example in the photo to the left). These are the earliest types, manufactured at Binns Road, where the gear is stamped Meccano England. 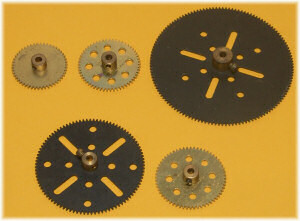 Later gears with the same stamping, then with the bar (French, where the word "England" has been removed from the mould), and black gears all appear to have shorter bosses. There are only a small number of parts stamped "England" with short bosses – it is possible even that these are old stocks from the UK but with bosses added in France. The 'long boss' version is approximately 14mm (0.55''), the 'short boss' version is the same length as brass pinions, at 12.7mm (0.5'' exactly). Until 1981, when production was shifted from UK to France, French Meccano never used plastic gears (other than 27f). Since 1981, they used plastic gears only in the range they started to manufacture intended for the UK, namely the 2000 and 3000 sets, the Sprint Action Packs, and the M0, M1 and M2 sets. In their own range, the Enthousiaste series, they went on with brass gears up to the end of it, in 1992. After 1986, there were no more separate ranges for the UK and French markets and all the new sets released as from 1989 which made use of gears came with plastic ones. As to the black plastic gears, I believe they were never made in UK. Even in France, they didn't exist until 1993. Black 28 plastic contrates were first seen in two sets of the 1993 Dynamic series. And black 26 pinions, 27a gear wheels and 32 worms were first seen in 1994, in the Master Construction set and (27a and 32) in the Erector Ferris Wheel set. All these come, of course, with short bosses. Whether we can call all of the early variations of the gears true "variants" is debatable. Some of them are very unusual and only very small numbers of them exist. One of the most elusive is the four-hole part 27a (which we don't yet have a picture of for the table below), but Ed Barclay helpfully spotted a stray one in model 319 "Pit Head Gear" of the 1922 Meccano Book Number 1. A scan is shown here. The part thus dates from before 1922 (and from the quality of the photograph I would suggest it was not one of the last models to be included in this manual). However, there is also a later non-quartered 3'' pulley (part 19b) in the model, dating it from no earlier than about 1919/1920. This kind of detective work is about as good as we can get, but remember that the photograph could easily have been of a model built from an old set of parts. Many of the models and diagrams in this particular manual go back well over a decade, and include tongue-keyed gears! ¹ In this list, 'very thin' means around the same thickness as a short Meccano strip or thinner, 'thin' means just under the standard later gear thickness, just under twice as thick as a strip, and 'thick' is an unusually thick gear, almost three times as thick as a Meccano strip. Where thickness is not mentioned, the standard thickness of a gear is around twice as thick as a strip. 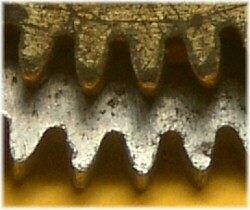 ² Prior to 1912, all gears had old-style teeth, longer and thinner. All gears after this change had correctly shaped involute teeth. Total number of messages on this page: 24. This is page 1 of 4. I have a nice example of both the bronze plated and nickel plated 27c, but I'm put off sending pictures given the negative comments appearing here concerning the response (or lack of it) which others have received. I am also frankly amazed at the attempt here to define "thick" and "thin". Whatever happened to the Micrometer and Standard Wire Gauge? Don't they have these in New Zealand? There's a lack of technical discipline here which eats in to the credibility of the whole site. Sorry but someone has to say it!! Someone's already pointed to a set (see below) which contained the green gearwheels but there was no response at that juncture. I don't mind posting pictures but last time I did so (not green gear wheels, by the way) the message was ignored, the pictures never appeared and the information was wholly disregarded. Still an excellent website though. Having seen the recent post in connection with the green multi-purpose gear wheels, I am delighted to inform you that the answer has been staring you in face for two and a half years! In March 2011, I posted the comment which appears below. No-one on your site took a blind bit of notice of it. I have previously posted other comments regarding unusual parts from the 1960s. On one occasion, I even sent photographs of the parts. My comments were similarly ignored and your information was not updated and thus remains incorrect. "A message appears elsewhere on this fine site with regard to the presence of green multi-purpose gear wheels. I hope that my experience is helpful; in or about 1979 I purchased a "new old stock" 1977 Set number 6 for the princely sum of £16! The set is the one with the short-lived picture of the children on a revised box lid. I have never used the set. The multi-purpose gearwheels appear to be black when viewed in the box but a closer inspection reveals that they are a somewhat dark green. I know that these parts have never been removed from the set so the information may be useful in placing the timing of this particular colour." I've always believed that all 60 tooth gears were stamped 60. I don't believe any others are stamped.